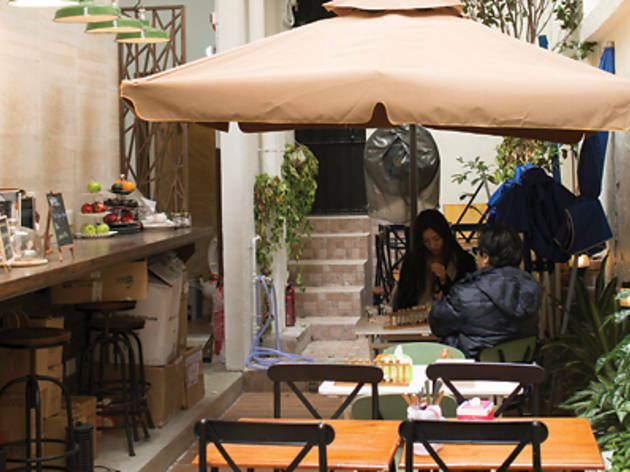 Sitting in a narrow shop high above the hustle and bustle of Sheung Wan, 3rd Space appears at first glance to be nothing more than just a brunch café with a garden patio. But don’t be fooled: its rustic street-side exterior belies a surprisingly sophisticated philosophy. ‘3rd Space’ is a term derived from a postcolonial sociolinguistic theory that celebrates the uniqueness of the individual, so the café’s menu is highly flexible, allowing each diner to customise his or her meal. On our visit, we opt for the indoor seats to stay out of the chill but soon regret not choosing an outside table. 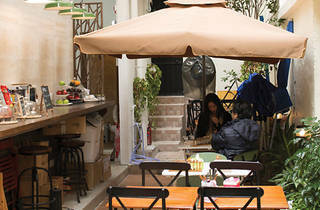 The patio is situated in a leafy green avenue that extends from the street all the way to the back of the café. To get lunch off to a warm start, we select a pot of piping-hot angel’s kiss tea ($68) from the list of speciality German blends, which has notes of white tea and fruit, and is as calming as its name promises. The chef recommends the omelette with toast (pictured above, $68), which we get without any extra toppings. Despite this, the omelette is creamy on the inside and comes stuffed with cheese and crunchy red onion, which makes for a deliciously satisfying contrast. The side of green salad ($25) is not as freshly made but the tangy sweet-and-sour dressing makes up for the lack of crispness. For dessert, we can’t resist the oven-baked mini pancakes ($78), which come in a set of six, with three fillings of our choice. The honey and condensed milk varieties are almost indistinguishable from one another since the fillings have melted into the batter, so the best of the bunch by far is the Nutella, which oozes hazelnut-and-chocolatey goodness like a lava cake. The only disappointment is that we don’t get to try all seven fillings. 3rd Space G/F, Tai Hing Bldg, 22A Po Hing Fong, Sheung Wan, 2547 4149; fb.com/3rdspacehk. Lunch for two: $330.